I recently had an intense experience that now lingers in my head. It surrounds my moments of tranquility and appears vividly in my minds eye. This moment was overwhelming and intense but not in a bad way. I wasn’t frightenend or uneasy, but rather focused and almost in aw of what I was seeing. I believe that a waking dream is an emotionally charged event that stands apart from the rest of your day. 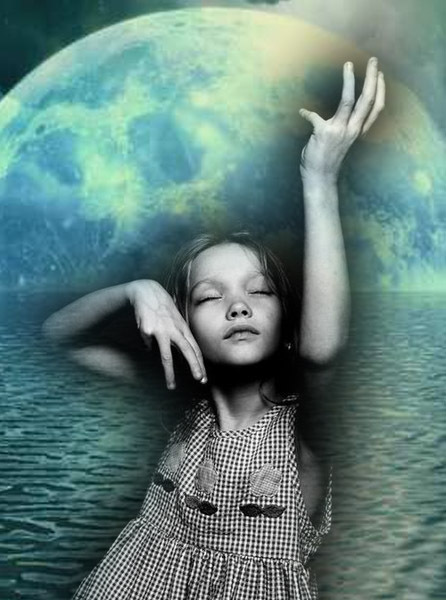 Each waking dream in our life is divine. They are created for our spiritual growth. That said, this is what occurred . . .
Several nights ago I lived through this particular moment of what I am now calling a waking dream, although I had not yet fallen asleep. I got into bed, turned off the lights and started to get comfortable with my blanket and pillow when a red light captured my attention. I looked over at the light and saw two eyes, a woman’s eyes. I began to focus my vision and allow my eyes to adjust to the darkness in the room. Was I seeing things? Once my eyes adjusted, I could clearly see, there was no mistake. It was a woman’s eyes. At first it appeared to be the eyes of a woman who’s face is covered by a Saree, but as I continued to examine, the woman was only wearing a mantle over her head without covering her face. I was still confused and in disbelief of what I was witnessing. My rational brain began to take over and so I did the logical thing to do. I began rubbing my eyes. Then I covered one eye to look and then the other eye, but the image was still very clear right in front of me. Once I realized it wasn’t my vision, I relaxed a bit and continued looking back at the eyes that were utterly fixed on mine. Now an amazing thing started to occur. The eyes and face of this woman began to transform into what looked like a black dog or a wolf. I was puzzled. Who was this? Why was I seeing this? A message no doubt, but what could it be? The image of the wolf/dog’s face morphed back to the woman’s and then back to the wolf and back to the woman and it continued happening for a few seconds before it remained as the woman. Those eyes! Needless to say, I eventually turned to my side and fell asleep. The next morning, the first thing to come to mind was what I had witnessed, and thus began my investigation. I searched the web for a connection between a female deity, a goddess, and a wolf or dog. I immediately found that the goddess Hecate was connected/associated with dogs and is sometimes depicted wearing a mantle over her head. Thus far, it could quite possibly be this vision is of Hecate. She is among other things a goddess of crossroads and transitions. Something I am currently experiencing in my life. My search continues . . . In some readings, I noted that crows are also sometimes associated with Hecate. Now it’s beginning to come together. Last November (2011) I had my first encounter with a crow. Having never seen one, other than on television, I experienced a very out-of-the-ordinary moment with a crow. As I was exiting a parking lot and moving slowly across the isles of parked cars, a crow decided to fly down from where ever he was and land on the hood of my car, then immediately swoop upward to perch on a stop sign just to the right of me. I stopped, and I looked over at him. It was indeed a crow! I couldn’t not believe my eyes! A crow! This was a very exciting moment for me. I saw a crow! Later I found out that crows are associated with messages. And thus I took it as that. A message. After this encounter, I continued to have many others with crows. I was seeing crows everywhere, flying over my house, singing while I walked my puppy, in movies, on outings, they were everywhere. A few days after the vision of the woman/dog in my bedroom some nights ago, I visited a store. As I was already standing in line waiting to pay for my items, when I suddenly felt a strong pull. A force I couldn’t resist wanted me to leave the pay isle and go back a few lanes to where the merchandise was. On a shelf were some seasonal decorations and on that shelf were 2 little black crows. Needless to say I purchased them as well, and they are now perched upon my bedroom dresser mirror. Now what does all this mean? Are the crows related to the vision of the woman and the dog/wolf? 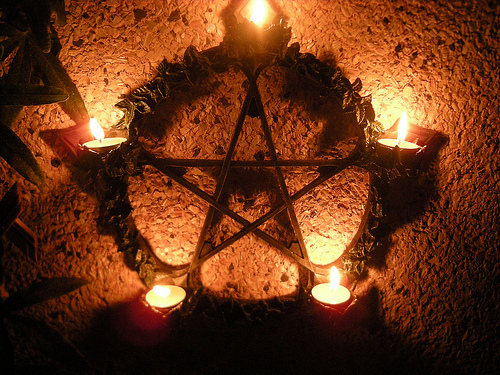 I needed to be sure, so I consulted with some women I trust, who happen to be daughters of Hecate. Based on my descriptions of what I saw, how I felt and the experience as a whole, it seems that this indeed was The Goddess of the Underworld herself, Hecate. HECATE, Hekate, Heket, The Distant One, The Far Darter, Queen of Night, Night Mother, Queen of the Ghosts, Queen of the Witches, Mother of Witches, Mistress of Magic, Most Lovely One, Goddess of Paths, Goddess of Crossroads, Goddess of Transitions, The One before the Gate. use magic upon a person from a distance. Hence the appellations “Far Darter” and “The Distant One” given to Hekate. 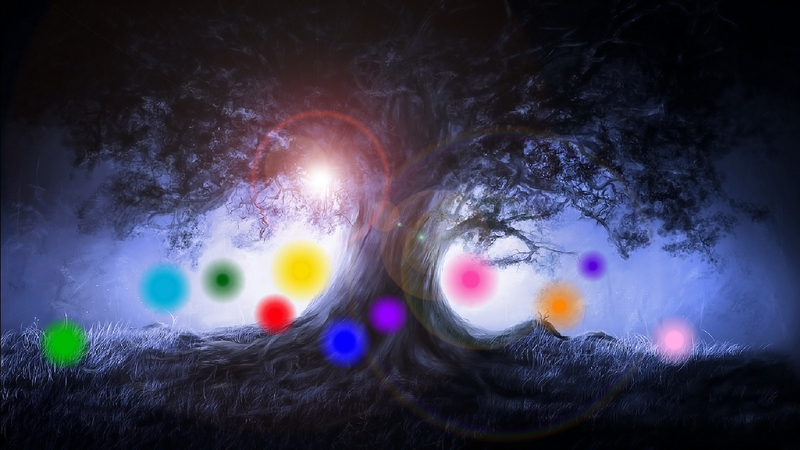 Image I created that closely depicts how I see Hecate. The Priestess then holds up the chalice and the Priest lowers the point of the athamé into the chalice which is commonly filled with red wine (different groups will use different liquids such as mead, while some will use water as it is considered to be one of the most sacred liquids of all). The Priest gives the athamé to the female covener and then places both his hands around the hands of the Priestess as she holds the chalice and then kisses her and she sips from the cup. In turn she kisses him and he then sips, all the while both keep their hands together holding the chalice. The Priest then takes the chalice and they both stand. Then the Priest will begin the passing of the chalice. In a traditional coven, where all acts are done male to female and female to male, the Priest will start this by passing the chalice to the a female in circle with a kiss and then she to a male with a kiss and so on until the chalice comes back to the Priest. The Athamé is placed on the altar and the woman takes the dish and, with a kiss passes it to the man, then he passes it back with a kiss, and then the woman begins the passing of the cakes, by giving the dish to another male in the circle with a kiss. At the point where the Priest says “Lance to grail”, if this section is used in the rite in token, the Athamé would be placed in the chalice. If the rite is being done in truth, this would be the point of physical union. Now, this is very much a traditional Wiccan method of doing this and is the publicly know version that is often said to be Gardnerian in nature. This version specifically comes from Janet and Stewart Farrar’s, The Witches’ Bible Complete. I have been a witch at heart for as long as I can remember. Although I didn’t know how to identify it being that I grew up in the Catholic faith. I admit I was pretty lucky as I was never forced to continue going to church or bible studies when I was old enough to decide, which for me was about age 12. I’m not saying that I renounced my religion. On the contrary, I embraced the spirituality of it even more once I began upholding the faith I had learned because it was now in my heart, in my soul, in my hands. I had several tragic life-changing moments when growing up. I was sexually abused and molested by two predators, both whom I knew. And later in life, I also suffered a great illness, when I was diagnosed with End-Stage Renal disease at the age of 18. These things scarred my soul and when added to heartache from a failed marriage and the inability to bear children, it was more than I could take. Depression followed along with self loathing and lets just say I was in a very dark and lonely place. I had always been curious about Wicca ever since I was 16 years old, when I wrote a research paper on the subject for English class in high school. I didn’t know that this would be tattooed deep within me and would serve as the light within that grew over the next two decades. Later in life, when my life had seem to have fallen apart, is when I began my practice as a witch. I had not turned my back on Christianity but in turn, I had blended both in a gradual concoction that worked for me. I read some books I had acquired over time about Wicca, and I began to incorporate it more and more into my life. It was the refocusing of doing something purely selfish, something that was solely for me and me alone, that began the healing process for my pain-ridden soul. I did not know that this is what I was doing but it is a decision I am truly grateful to myself for having taken those steps. I acquired some magickal tools (which I now find aren’t necessary, just fun & sparkly to use) and I embarked upon a magickal journey that has brighten my life in every possible way. I have healed myself. I have healed my soul. I am a new woman. I am not Wiccan. I am not Christian. I am a beautiful soul who is learning how to continue to heal and grow beautiful each and every day. I am walking the path my heart and my mind are guiding me to follow. I trust myself and I have undying faith with the purest of hearts. I am healthy now and taking care of that aspect of my life with the utmost dedication. I will not neglect any part of me, for I now love all of me. I am happy. I am a woman. I am a witch. I am walking through the gateway to a new level of spiritual evolution. The signs are all around me. A journey that began so very long ago, and not a few years ago, but hundreds of generations past. It’s a fire that runs through my veins. A veil has been lifted and I can now see where this path has led me. It is only now that I must continue my journey, make my continuing path. A path that my ancestors began so long ago. A path that I am creating for my family’s future. 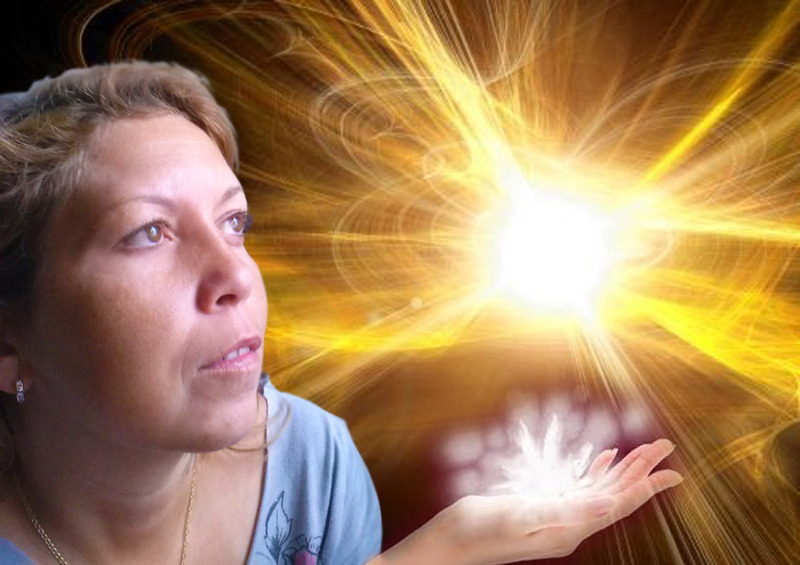 I have begun this blog to write about my experiences through this beautiful Divine journey. Welcome to the Lioness’ Den! I am reborn. 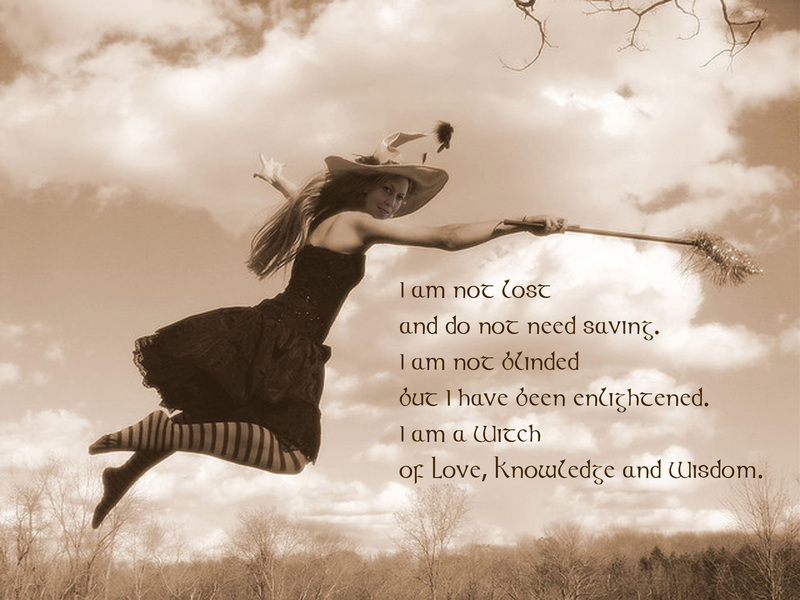 I am a Witch. 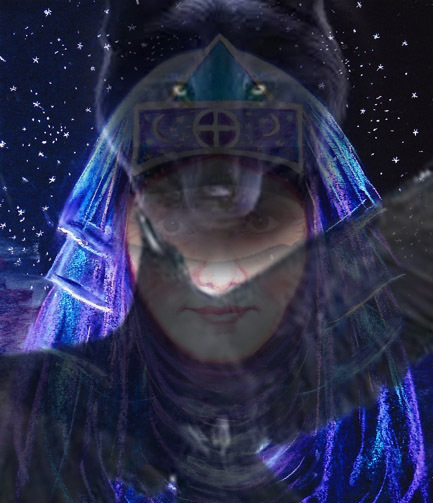 I am a Priestess!